Amanchu! Wallpaper: "The Story of the Girl and the Ocean"
Minitokyo »	Amanchu! 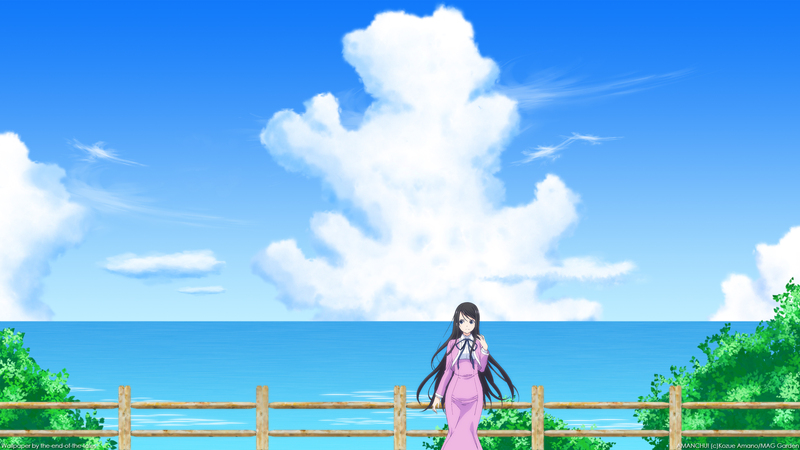 Wallpapers » Amanchu! Wallpaper: "The Story of the Girl and the Ocean"
Maybe some of you from AP back then know that I love to make ARIA wall and also the art style of Kozue Amano, the author of the series, was inspired me a lot. Then I realized that on MT there is no Amanchu! wallpaper, another series from Kozue Amano. So, I decide to make one, featuring Futaba Ooki from Amanchu! series. Everything is done in Photoshop CS6 using graphic tablet except the wooden fence and the character. Please, enjoy this wall. Thank you. I love the atmosphere of the wall, the wide canvas and how perfect everything is placed. her expression seems very unfitting for the gorgeous scenery behind her. Other than that I think it's a very nicely executed summery wall. i love the background, the sky looks pretty neat and the trees blend well. Also the ocean gives such a calm feeling. I do agree with Kitaan about the scan and fence not matching well with the rest of the scene since it was extracted and it looks a bit unclean. Its a pity cos if u manage to improve the scan's quality a tinny bit this would look pretty awesome.